If it's the one posted today it looks sketchy to me also. The pics that I was sent are of a left handed sword that doesn't look quite right. The handle looks too curved for an Albion and there are 7 rivets in the handle as opposed to 4 in the pics from the Albion site, the guard and the nagel don't look right either. Additionally the guy said he wants payment through bank transfer. Personally I wouldn't touch this sword with a 10 foot pole, but that's just me. Agreed. He gave me a Paypal address that was somewhat suspect. I did notice the knecht pics too. Location: Suburbs of Wash D.C. Going by what Lloyd is describing; If the images you received look like this sword below, it is an Arms & Armor custom piece. Not an Albion. It was sold on the sword forum intl. back in Jan of 2015 by a Jason Elrod. It looks to be a very close replica to an extant 16th century piece. I'm not vouching for the seller but I do live near them in the same state, and I'd be willing to swing by and see it in person and check condition, if you'd like to arrange it. I have no financial or personal interest in it. Personally, I would be patient and wait, even though that might be frustrating in this situation since Albion is no longer selling the Knecht. But better to order from someone known on the forum, especially when this piece is not even an Albion. Just curious, but is the picture I posted Exactly like one the seller sent? (on a wooden table with a piece of leather on the table)? If so, it's likely they just grabbed the pics off of the same Sword Forum Intl. listing. Which is another red flag. I just reported the seller's post. There's enough legitimate concern and doubt over what he's selling that I think having the post removed is warranted. 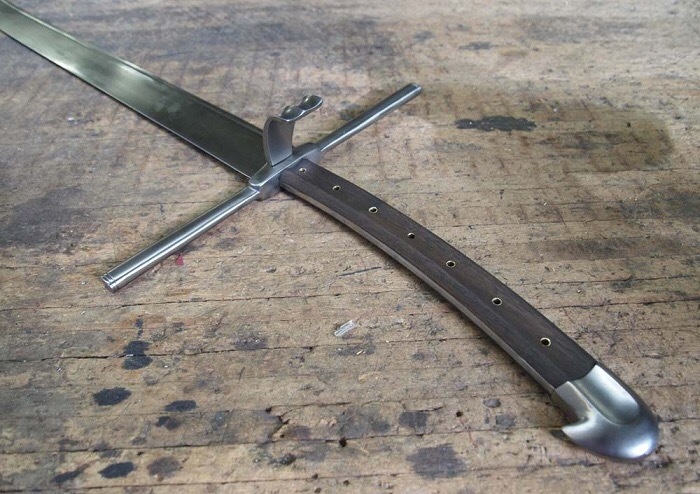 I would hate to think someone might agree to buy the sword without seeing the photos only to find out they did not get the right sword- and in this situation, that result would be the best case scenario.The seller has no good excuse to claim ignorance here; it's easy to know what a real Albion Knecht looks like. Better to prevent anything deceitful from happening in the first place. Terry, it looks to be from the same set of pics, it's definitely the same sword. Yes. Same pics can be seen on these two links from Jason Elrod's original posting. Another flag: Silver Spring in Maryland is two words, not one. Someone who lives there would probably know that. I am glad to see you guys looking out for each other and making this discusion public. This is how a healthy community stays healthy. I have more comments but will save them for now. At this point I will direct you all to read the Marketplace Rules document about bank transfers and vetting listings and members. There are many red flags here. If memory serves, that Kreigsmesser is a left-hander, anyway,if it was Jason Elrods. I bought this sword off of Jason in January 2015, it is still in my display case at home, so unless he made another left hander this one is mine, and it is definitely not for sale. Thread selling this sword on another forum was removed and seller banned. Picture was identified by a long standing member of the forum as his custom sword and his photo. He still has the sword in his collection. I actually have this guys cell number. His name that he was using is Hiro Pitts / Eduardo Warden. I've kinda been following him for a while and have spoken to the FBIs cyber crimes regarding him. If your thinking why post this and make him aware he already knows he's being looked into. What are you trying to say? You're linking to your own post. How am I supposed to interpret that? I can't tell if you are trying to point something out that you want me to take action on or what.